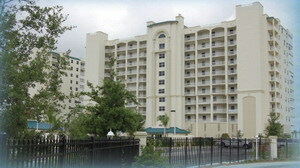 Harbor Pointe, in the quaint little town of Titusville, exemplifies luxurious living. Spread over four buildings, including the Harbor Grand, six floor plans are offered—two of them penthouses. Even the two-bedroom, twobath condo is much larger than average, encompassing nearly 2,000 square feet. "Harbor Pointe has a huge heated pool and spa, tennis and basketball court and a recreation building with an exercise room and sauna"
Several three-bedroom plans are available, but the real piéce de resistance is the penthouses. With four bedrooms, three baths and nearly 3,700 square feet of living space, the Forecastle is the ultimate in condo living. Every detail at Harbor Pointe has been attended to — little touches such as lever door handles, computer centers with phone jacks, cable TV jacks, dedicated electrical circuits and crown molding. Even if you don't enjoy cooking, you'll appreciate the gourmet kitchen, which is complete with a solid-surface counter top, designer faucet and under-cabinet lighting. The appliance package includes a 25-cubic-foot side-by-side refrigerator, smooth cook-top range with self-cleaning oven, microwave with sunken turntable and dishwasher with sound insulation. But the best is yet to come. The spacious master bedroom will be your haven. It features air conditioned walk-in closets, a whirlpool tub with tile surround, separate tiled shower and dual vanities. Amenities go far beyond the usual. Harbor Pointe has a huge heated pool and spa, tennis and basketball court and a recreation building with an exercise room and sauna. As wonderful as these extras are, they pale in comparison to the spectacular views of the Indian River from every residence. You can watch the space shuttle launch from your balcony, it doesn't get much better than that. The Harbor Pointe lifestyle can easily be yours. Prices range from $385,000 to $1,500,000.